New York - Brooklyn District Attorney Eric Gonzalez today announced that a 38-year-old man was arraigned on an indictment in which he is charged with assault as a hate crime, menacing as a hate crime and related charges in connection with a seemingly random attack against three Jewish men that took place on a Borough Park street. The District Attorney identified the defendant as Farrukh Afzal, 38, of Mariners Harbor, Staten Island. He was arraigned today before Brooklyn Supreme Court Justice William Miller on a 17-count indictment in which he is charged with second-degree attempted assault as a hate crime, third-degree assault as a hate crime, third-degree menacing as a hate crime and other related offenses. He was ordered to undergo a psychiatric exam and to return to court on January 14, 2019. The defendant faces up to seven years in prison if convicted of the top count. The District Attorney said that, according to the investigation, on October 14, 2018, at approximately 7:25 a.m., the defendant was driving a cab on 13th Avenue and 44th Street in Borough Park, Brooklyn. As he drove past a Hasidic man, the defendant allegedly swerved his car as if to hit him, causing the man to run away so he wouldn’t get struck. The evidence further shows that the defendant then sped up, drove for another block and a half and stopped. 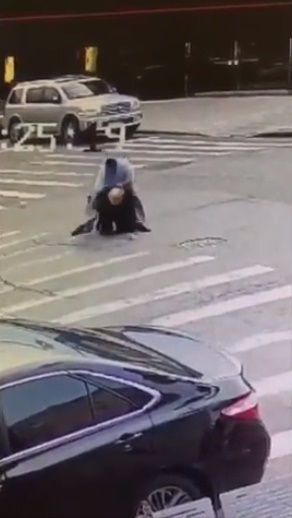 He got out of his cab and ran towards another Hasidic man, 62, who was standing at the corner of 13th Avenue and 46th Street. The defendant allegedly struck the victim, who ran, and chased him into the intersection, where he continued to beat and body-slam him, causing lacerations and bruising to his face and body. As the defendant ran towards the victim, he did not attack a delivery man who was not wearing Hasidic garb, but was closer to him, the evidence shows. The case is being prosecuted by Senior Assistant District Attorney Jacob Uriel of the District Attorney’s Grey Zone Trial Bureau, under the supervision of Assistant District Attorney Danielle Eaddy, Bureau Chief. Time for basic self defense classes for all SHAYNA YIDDEN. Major reason Jews are assaulted is that everyone knows they don't fight back! When any other random male of any other ethnic group is attacked, they FIGHT BACK! You're language indicates that you are an anti-Semite and not Jewish.